Here are three recipes for excellent winter delights that I have prepared. For that reason alone, they are clearly simple to fix, but they are so good. Heat 1 tablespoon olive oil in a large Dutch oven/soup pot over medium-high heat. Add chicken and cook until almost cooked through. Remove to a plate. Melt butter with 2 tablespoons olive oil in the now empty pot and heat over medium-high heat. Add onions and carrots and cook, while stirring, for 3 minutes. Add bell pepper and garlic and cook for 1 minute. Sprinkle in flour then cook, stirring constantly for 3 minutes (it will be thick). Turn heat to low and gradually stir in 8 cups chicken broth. Whisk 3 tablespoons cornstarch with 1 cup additional chicken broth and add to soup. Stir in chicken, beans, chicken bouillon, and all remaining herbs and spices. Stir in lasagna noodles. Bring to a boil then reduce to a simmer until lasagna noodles are tender, stirring occasionally so noodles don’t stick to bottom (approximately 20-30 minutes). Turn heat to low, discard bay leaf and stir in half and half, optional heavy cream and spinach and warm through. Stir in 1 cup Parmesan cheese until melted. Stir in additional half and half or broth if desired for a less “chunky” soup. Season with additional salt and pepper to taste. Garnish individual servings with the desired amount of cheese. This beer and horseradish beef stew is the definition of pure comfort food! Cooking it in the slow cooker makes for the most tender pieces of beef and veggies with a rich, silky sauce! Season beef pieces with 1 1/2 tsp kosher salt and 1 tsp black pepper. Heat vegetable oil in a large skillet over MED-HIGH heat until shimmering, then add beef in a single layer (you may have to do this in batches to avoid overcrowding the pan). Brown on all sides, about 1-2 minutes per side, then turn off heat. Remove beef to slow cooker. Pour beer and broth into hot pan and stir to loosen any browned bits. Let sit for a few minutes while you add other ingredients. Add carrots, parsnips, potatoes, onion, garlic, sage, beef base and tomato paste to slow cooker with the browned beef. Pour beer/broth mixture from the skillet into the slow cooker. Cover and cook on LOW for 7 – 7 1/2 hours. Mix together butter and flour to form a pasty ball. Remove lid, add horseradish and butter/flour mixture, stirring well. Cover and continue cooking another 20-30 minutes, stirring occasionally. Taste, and add additional salt and pepper as needed. Sprinkle with fresh parsley and serve! If your stew gets a lot of fat particles at the top after cooking, either skim it with a spoon or remove beef and veggies to a bowl, then pour liquid through a strainer into the bowl with the beef and veggies. Even bad pecan pie is good!! Add granulated sugar and eggs to a large bowl. Whisk together until well-combined. Add in corn syrup, melted butter, vanilla, and salt. Stir in pecan halves and pour into unbaked pie crust. Place in oven and bake 45 minutes to 1 hour, depending on your oven. A piece of foil may be placed over the top for the last few minutes of baking to prevent the edges of the crust from becoming over brown. You’ll want to make sure that the center of the pie does not jiggle a great deal when you move the pie pan slightly. If it does, leave it in the oven for about 5 more minutes and test again, repeating every 5 minutes or so until it just barely has any movement in the middle. It will continue to firm up once removed from the oven and cools. Also, if you touch the center of the pie, it should slightly spring back to the touch. The more you make it, the more you’ll have an eye for when it is just right to remove from the oven and not overbaked or under baked. You may place a piece of foil over the top for the last few minutes of baking to prevent the edges of the crust from becoming too brown. Enjoy! Butter a 9-inch pie plate or skillet and set aside. In a large bowl, combine flour and salt. Cut in shortening and butter with a pastry blender or two forks until the mixture resembles a coarse meal. Gradually add enough ice water to the mixture while mixing with a wooden spoon until a ball of dough is formed. Pour the dough onto a lightly floured sheet of plastic wrap and form into a disc. Lightly flour the top of the pie dough and place another sheet of plastic wrap on top. Rolling from the center, roll until the dough is about a 1/8-inch thickness. Remove the top piece of plastic wrap, fold the dough over and lay across the pie plate and remove the bottom piece of plastic wrap. Press the pie dough lightly into the bottom and sides of the pie plate. Cover the pie plate with a piece of the plastic wrap and place in the freezer for at least 30 minutes to overnight. If pre-baking, use a fork and lightly prick the bottom and sides of the pie dough. Then preheat the oven to 425º F and bake the pie crust for about 8 minutes. If not pre-baking, simply fill the pie crust with pie filling and bake according to instructions for the pie recipe. Buy a nice pre-made pie crust at the grocery store. I used to sit at the counter at Ernie’s on Market Square in Roanoke and marvel at the delicacies that came off that grill. One of those delicacies was a potato pancake. They were crisp, brown and delicious. I didn’t even use ketchup. After Ernie’s closed, I decided to make my own. Here are the ingredients and the simple recipe. In a medium bowl mix together the mashed potatoes, egg, flour, salt, pepper, garlic, and chives if using. Preheat a large skillet with 2-3 Tbsp. of canola or enough to give an even layer in the pan. 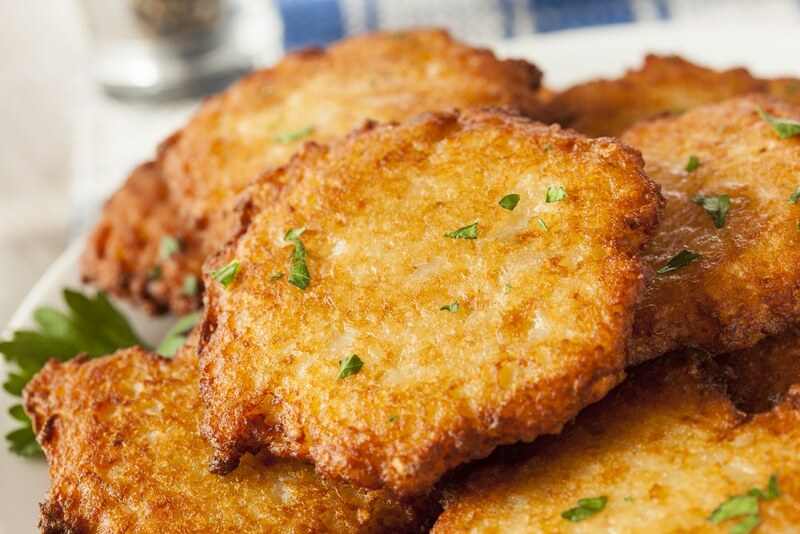 Form the potato mixture into patties and fry them for a couple of minutes until they are golden brown. Turn them over and fry on the other side. Serve hot with a sprinkling of chives. BY THE WAY, I have written several books. Take a look at them at www.tmichaelsmith.com. Start with a large mixing bowl. Add the ingredients together and blend using a large whisk. Whip the ingredients until the mixture has a consistent color and the contents seemed to be properly mixed. I used three pounds of flank steak that I had the butcher at Fresh Market cut for me. I then placed the steaks in a large Tupperware Marinating container and pored the mixture over the meat. I let the steaks stand in the mixture for 24 hours, turning the container over every two hours when I was awake. I set aside a small portion of the marinade that had not been in contact with the meet for basting when I grilled the meet the next day. The meat was unbelievably tender and very tasty. ENJOY GOOD EATING!